Nearly everyone loves ceviche. In fact, so many love this dish of fish marinated in citrus until “cooked” that most Central and South American countries – and at least one North American country – claim the dish as their own. Quite a few, in fact, claim to have invented it. 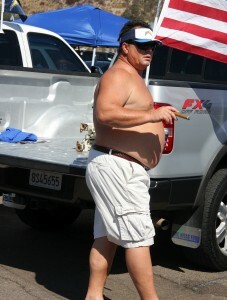 With the Miami Dolphins coming to town there was never a question that the tailgate would involve eating fish. There was little more question as to what sort of dish we would make: ceviche. Sometimes spelled “cebiche” or “seviche”, the essence of the dish is raw fish (or par-boiled seafood) cut into bite-sized pieces and marinated in citrus to the point of being “cooked.” The art of ceviche – and the essence of the many, many national and regional variations lies in what sort of seafood, what sort of citrus and what sort of garnishes and flavors to incorporate into the mix. Usually – but not always – ceviche includes some form of “heat” such as minced fresh chile peppers or prepared hot sauces. It generally also includes aromatics such as onions and herbs (often cilantro). Tomatoes are also a common ingredient, whether fresh (as in most of Mexico) or in the form of ketchup (as in Tecate, Mexico and in Equador). While many countries claim ceviche as their own, its country of origin is probably either Peru or Ecuador or, perhaps more likely, an Inca Civilization that knew nothing of such a border. This may come as a surprise to Americans – particularly those of us on the West Coast – who are used to thinking of it as a Mexican dish. So why would we think immediately of ceviche with the Dolphins coming to town? The answer has three names: Norman Van Aken. Miami’s greatest chef, Van Aken is the father of New World Cuisine – a thrilling fusion (in the best sense of the term) of the various Latin American cuisines that were already the natural influences on South Florida. Van Aken, though, searched a bit deeper and brought those flavors together in exciting and evocative ways. Ceviche was a natural vehicle and became one of his signature dishes. When I approached my fish monger – Mark Lane of Poppa’s Seafood – to acquire product for the dish I (of course) asked him what he had that was freshest. Our options were albacore or scallops. While the scallops sounded delicious, they weren’t strictly speaking fish, so they would not quite do. Of course, bottlenose dolphins aren’t fish either, so who’s counting? Nonetheless, we went with the tuna. While this version of ceviche is not directly Van Aken’s, it is certainly inspired by his. 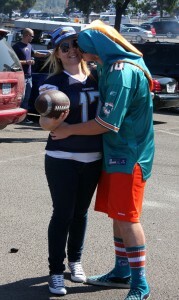 More inspired, I might add, than his Dolphins played on the day. 1. Make the Blue Corn Chips. Pre-heat an oven to 375° Fahrenheit. Quarter the blue corn chips and arrange them on a hotel sheet. Season the chips with salt and pepper and bake them until they are crispy chips but not burned. How long it will take will depend on the freshness (and water content) of the tortillas. Start checking for doneness as soon as fifteen minutes. 2. Begin “Cooking” the Fish. Combine the key lime and orange juices. 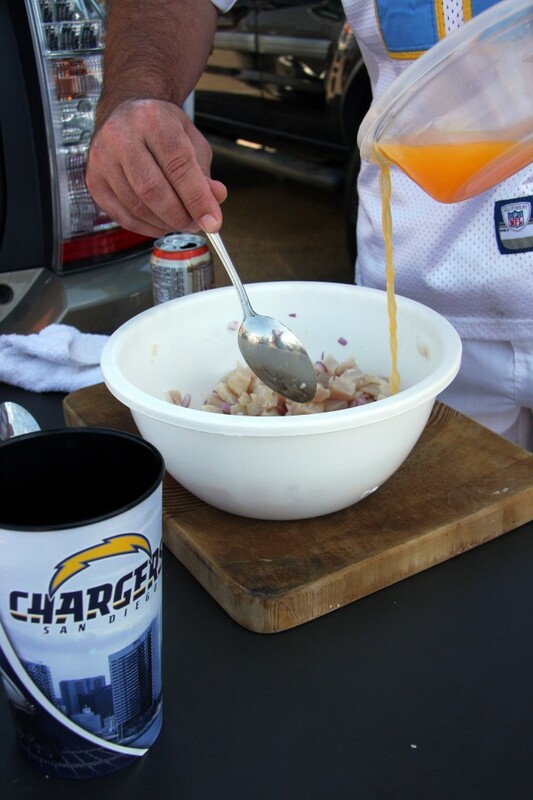 About an hour before serving the ceviche (more, depending on the type and freshness of the fish), combine the albacore and half the juice. After about half an hour, with the surface area of the albacore changing color, add the onions and up to ¼ cup of the juice (as needed to keep the fish submerged). Fifteen minutes later, add the kohlrabi and jalapeno peppers. If necessary, add up to another ¼ cup of the juice. 3. Bring the Ceviche Together. Ten minutes later, add the avocados, tomatoes, and the ketchup. Fold all of the ingredients together to combine thoroughly. Let sit for five minutes before serving. If it is too dry add up to the remaining amount of the juice. 4. Plate the Dish. Serve the Ceviche in a small bowl (if using as an appetizer at a dinner party, a Martini glass would be an excellent choice). 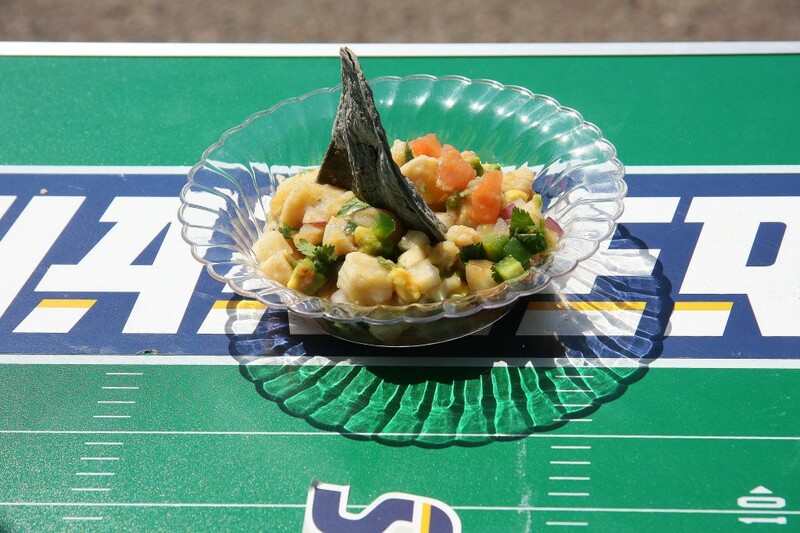 Sprinkle with the cilantro and place a Blue Corn Chip as a dorsal fin atop the ceviche. My idea in using the kohlrabi was simple: texture. As for the Peruvian’s claiming it, they’re probably not all wrong. WORLD FARE: At Little Sakana, how much pre-cut sushi is too much?